A glance at the probe's datasheet will show you its input resistance and capacitance. For a probe with a 500-MHz bandwidth, typical values are C = 9.5 pF and R = 10 Mohms. But one spec that's missing from the datasheet is ground lead inductance; that's because there are numerous ways in which people choose to ground their oscilloscope's probes. 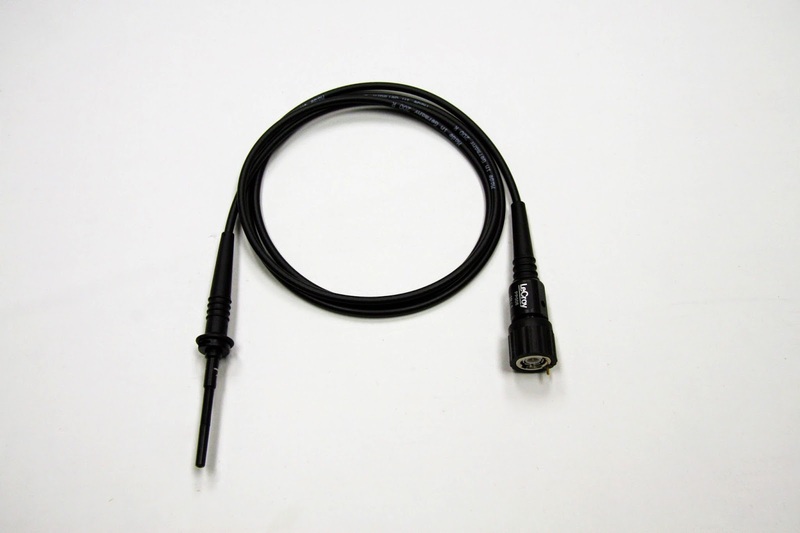 The most common way to ground probes is by using that long ground lead with the alligator clip at its end. However, this could create a ground loop inductance larger than 200 nH, which can greatly compromise the probe's performance. The equivalent circuit model for a probe grounded in this way is shown in Figure 2. The input resistance of 10 Mohms is large enough to be ignored in most cases. What we want to look at is Iground and the effect that different inductance values will have on the response of this circuit. The voltage across the capacitor is the value measured by the oscilloscope; the voltage represented by the AC source is the signal under test. To get an idea of how these two values will differ, let's look at the transfer function of this series RLC circuit, or the ratio of the voltage across the capacitor, Vc, to the voltage source, Vs. We obtain the transfer function by dividing the impedance of the capacitor by the sum of all of the impedances. By hand-picking optimal values for R and L, we can see the probe's 500-MHz bandwidth. However, one can get close to this performance by using Teledyne LeCroy's ground blade or ground spring probe accessories, which may have an inductance of 10-20 nH. It's also important to consider the ground-loop issue and connect to a close-proximity, low-inductance ground point on the DUT. Using copper foil can help with achieving a nearby ground connection and to minimize the length and inductance of the ground connection (Figure 3). We can see that the added inductance has moved the -3dB bandwidth of the probe from over 500 MHz to about 175 MHz. Not only that, but the probe's resonant frequency was pushed well within its bandwidth to about 115 MHz. At 65 MHz we can still see an error of 40%. In fact, to keep the error under 10%, we need to limit the frequency to 35 MHz. In a future post on this topic, we'll look at a practical example to see how this model holds up in the real world.